1. What are you expecting from our company? 2. What did you learn from your previous companies? 3. What do you want to be in next 2 years? 4. 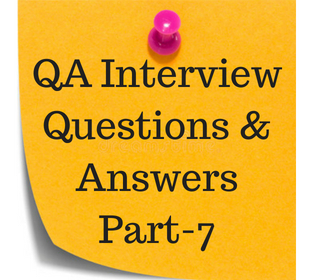 Why QA Lead? Why not something else? 6. Did you get any compliments from your previous employers? What were those situations? Answer: Yes. I did. There were many occasions where I had compliments. For example, I was testing an application going a little bit off my test cases. After I finished executing my test cases, I always think in a way what a real user would possibly click in various parts of the application. So I was just clicking back and forth and at one specific scenario, the application simply broke and displayed an error message. That scenario was not in the test cases. The manager really appreciated me and thanked for finding this kind of critical defect. Answer: Yes. I did. There were many occasions where I had compliments. For example, I was testing an application going a little bit off my test cases. After I finished executing my test cases, I always think in a way what a real user would possibly click in various parts of the application. So I was just clicking back and forth and at one specific scenario, the application simply broke and displayed an error message. That scenario was not in the test cases. The manager really appreciated me and thanked for finding this kind of critical defect. 9. What is your salary requirement? 10. Please provide information (an example) of your experience testing Linux and UNIX environments (including type of system tested, how tested, actual commands and steps used for test) Testing applications using Linux and UNIX. Answer: (This is what Mona answered): The risks by understanding the infrastructure of the application, hard drive and system capabilities etc. Also added “Risk and Mitigation Strategy” column within the test plan. The major risk for the company was system getting crashed upon receiving several hits by the users . Company did not set any metrics at the development phase as to what it can handle. I told him that i noted mitigation strategy to deal with each known risk within the test plan. 12. What is SQL and how is it used? 13. Does a tester have to know about cookie? Answer: Yes. A tester has to know HOW TO CLEAN cookies (Does not have to know the definition). 14. Why do we need to clean cookies? When we get a new build, we must clean cookies. (Remember, once the developers fix the defects, the configuration team makes a build and this process continues until the product (application) is ready to handover to the customer). If we don’t clean cookies, then there is a possibility that we may get the same error which was already fixed by the developer. Why? Because the error is sitting inyour computer hard drive and the computer feels easy to get the same information from the hard drive rather than going to the server and pulling new thing for the same thing. For example, let us say, when you were testing a page, there was a button called “OK”. The client decided that “OK” is NOT the right button here, therefore, that button name was changed from “OK” to “Continue”. Accordingly, you wrote a defect saying that “OK” button should be changed to “Continue” button. Now, this defect is fixed (the developer changed the “OK” button to “Continue”). Now, you started testing, there is a possibility that you might see “OK” button again. Why? Because you DID NOT clean your cookies. Therefore, you must clean your cookies before you starting testing a new build. 15. How to clean cookies? Answer: Cookies are cleaned in the browsers like IE (Internet Explorer), Firefox, Safari (for MAC and windows both), Netscape and so on.